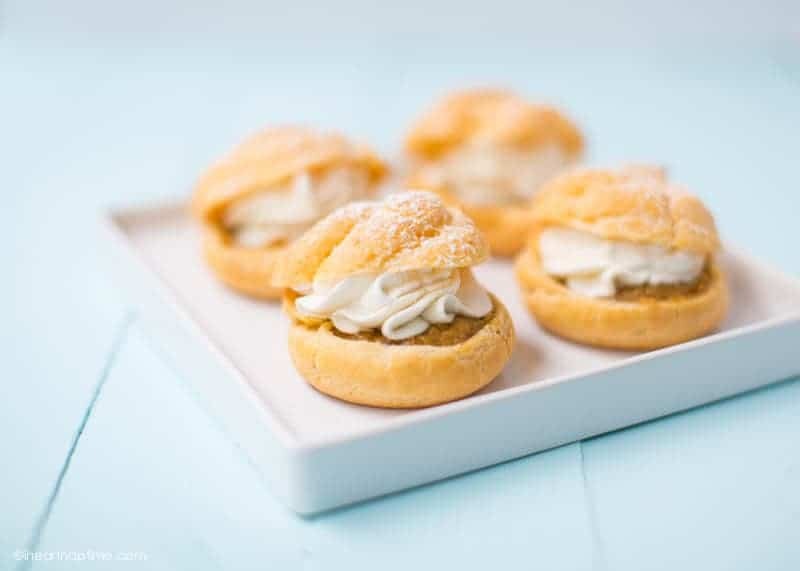 Pumpkin Pie Cream Puffs – a light and fluffy pastry filled with pumpkin pie filling and maple whipped cream. Cream puffs are an easy and impressive way to make a delicious dessert. They are light, fluffy and taste like heaven. Whip up a batch of these Pumpkin Pie Cream Puffs for your next holiday gathering and watch them disappear! 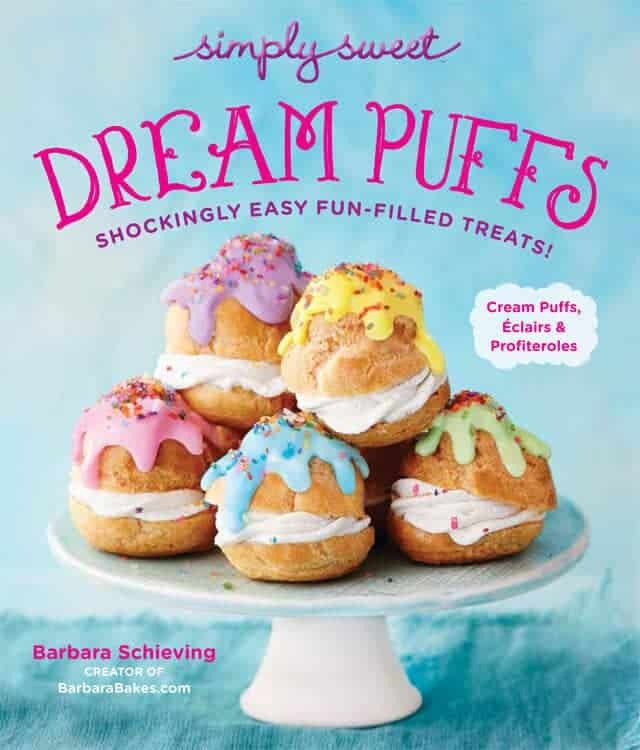 I made these pumpkin pie cream puffs from my friend Barbara’s E-book Simply Sweet Dream Puffs. It is such a gorgeous book and filled with so many gorgeous photos and delicious recipes. This was my first time making cream puffs and I never realized cream puffs were so easy to make. Now I do have to say they aren’t a recipe you can start and finish in an hour but it was definitely easier than I thought to make them. 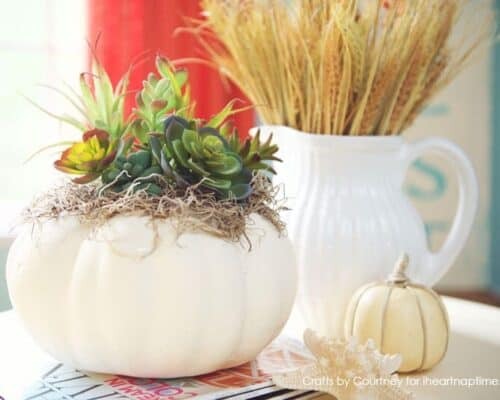 Just a few different steps …but definitely worth it when you’re looking to indulge in a fall treat! There are so many recipes I book marked in this book, but since it’s fall I thought it was only fitting to make the pumpkin pie cream puffs. 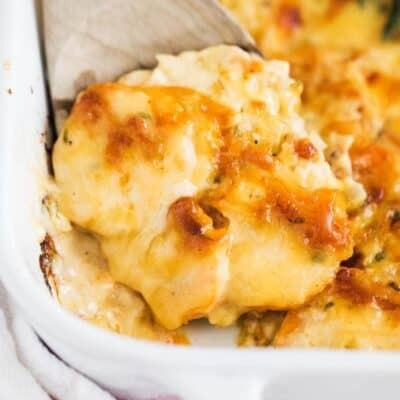 I did adapt the recipe slightly, but they did not disappoint! Everyone that tried them, told me they were “SO GOOD!” The maple whipped cream pairs perfectly with the pumpkin pie. Here’s a video tutorial from Barabara if you’d like more instruction on making the cream puffs. 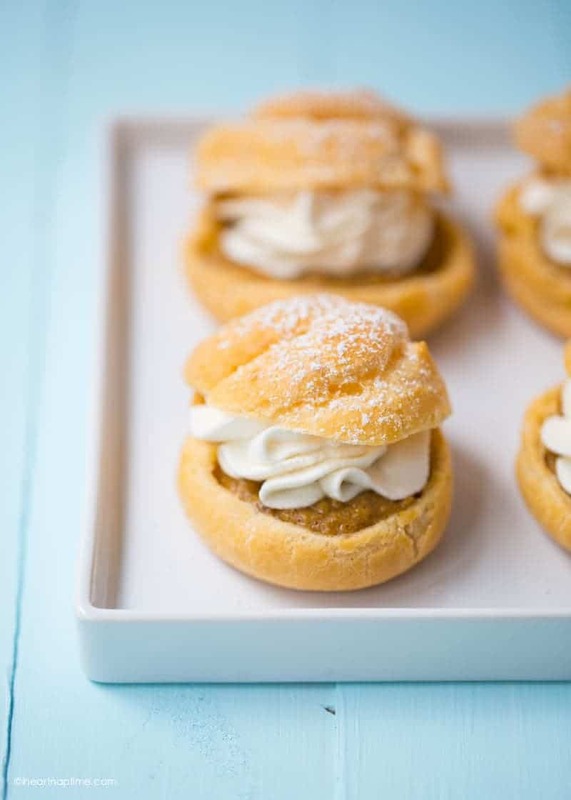 Pumpkin Pie Cream Puffs - a light and fluffy pastry filled with pumpkin pie filling and maple whipped cream. Preheat the oven to 425F. Line a baking sheet with a silicone mat or parchment paper and set aside. Bring butter, sugar, salt and 1 1/2 cups water to a boil in a large saucepan over medium-high heat, stirring occasionally. One it comes to a boil, remove from heat and quickly stir in flour. Return to medium heat and stir with a wooden spoon until the dough becomes smooth and forms a ball. Transfer dough to the bowl of an electric mixer and let cool for 5 minutes. Add eggs, 1 at a time, beating until mixture is smooth and glossy. Beat in food coloring and then spoon dough into a gallon size bag. Cut 1/2 inch off the edge and then pipe dough onto pan into 1 1/2 inch rounds (1 1/2 inches high). Bake for 5 minutes, then reduce oven to 375 and bake an additional 25 minutes or until puffy. Turn oven off and let shells stand in the closed oven for 10 minutes. Remove pan from oven and transfer puffs to a cooling rack. Whisk together brown sugar, eggs, salt, cinnamon, and pumpkin pie spice in a large saucepan. Whisk in pumpkin puree and evaporated milk. Cook over medium heat, whisking constantly, until mixture comes to a boil and thickens (about 3 minutes). Remove from heat and place in a Tupperware. Let mixture stand for 30 minutes and then chill 1-2 hours, or until cooled and thickened. Cut cream puffs in half horizontally. Spoon or pipe pumpkin custard, once cooled, onto bottom half. In a mixing bowl, beat heavy cream and a pinch of salt at medium speed until it forms soft peaks. Add 1 tablespoons maple syrup and 1/4 teaspoon vanilla extract, and beat until stiff peaks form. Pipe whipped cream on top of pumpkin custard and then add the top half of the puff. Chill until ready to serve. Sprinkle with powdered sugar just before serving. Best served the first day. These look amazing But Im wondering about the listed water it says 1 1/2 cups water but then later says to use 3/4 cup water ? I have read it over and over am I missing something ? I just don’t want to mess it up lol thanks ! These are perfection. I love how gorgeous they turned out. Your cream puffs look scrumptious! 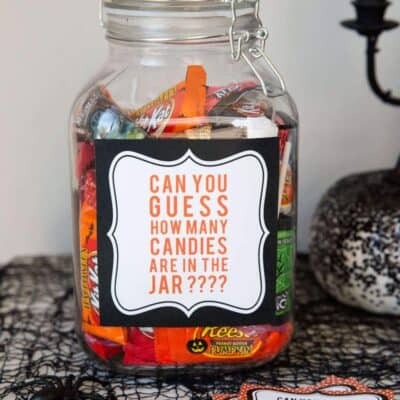 I can’t believe it’s your first time making them. So glad everyone loved them. Thanks so much for the sweet compliments and sharing my ebook! Cream puffs are one of my favorites but I have never made them homemade! This pumpkin pie version looks divine!! 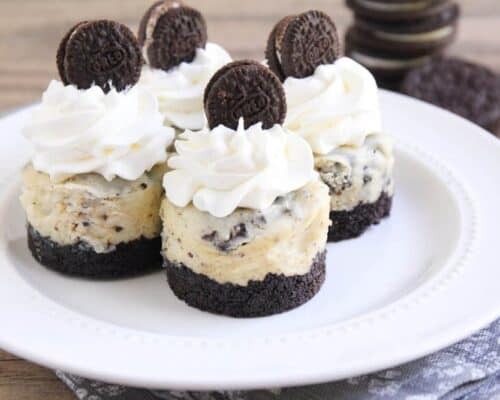 These look so delicious and so beautifully done, you did an awesome job!